Reminding us of a bygone era, our classic fashion inspired table lights will add personality, fun and unique wow factor to the home. 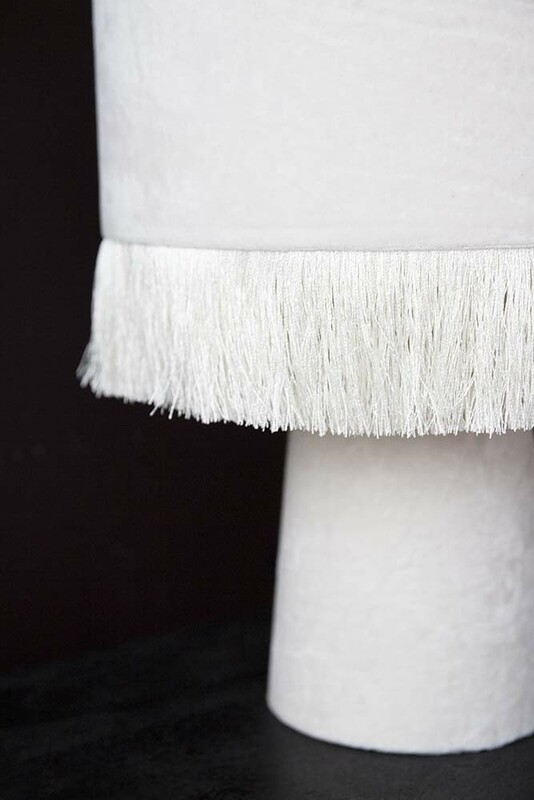 The table lamp is perfect for bedside tables and side tables and is dressed head to toe in white velvet with white fringing. The All Over Velvet Table Lamp With Fringing measures D25cm x H31cm. 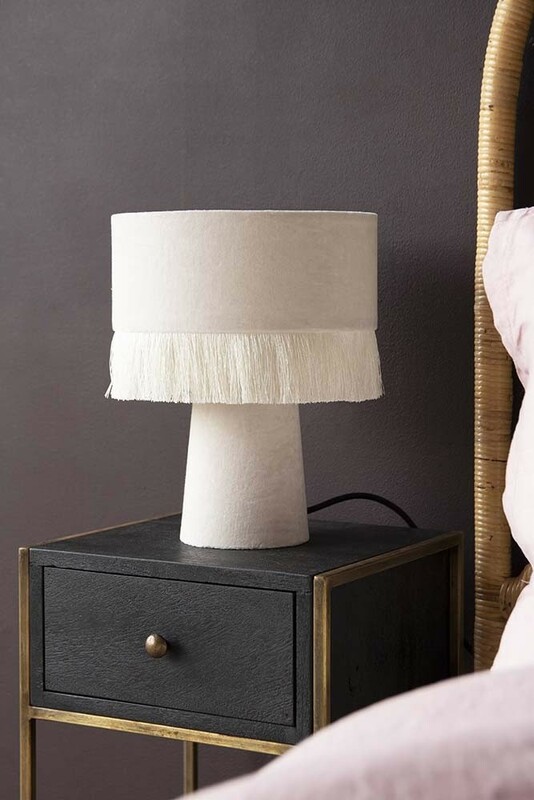 Adding luxe texture as well as sophisticated style to your side tables, coffee tables, shelves and bedside tables the velvet light shades will soften and add warmth to your home interiors. So, we think that this light will be loved by anyone looking for a fabulous lighting choice for your living rooms and bedrooms. Super glamorous, fun and a one-of a kind lighting choice, make a statement with this statement table lamp! 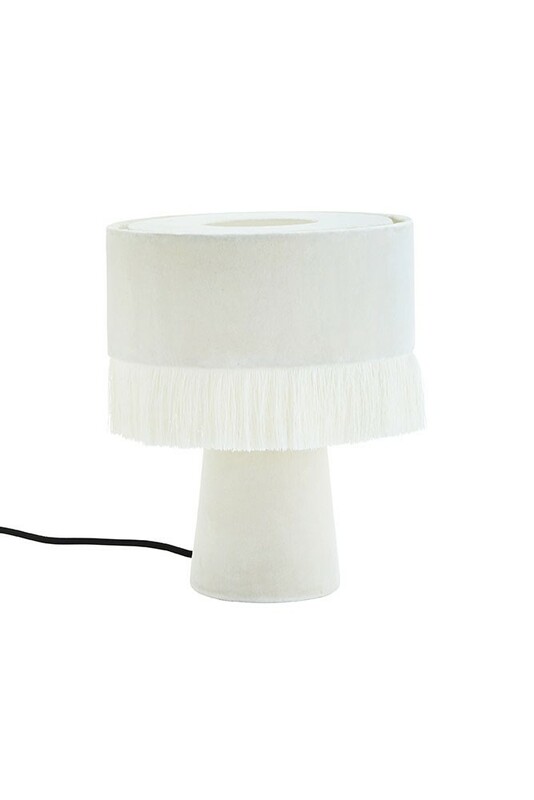 The All Over Velvet Table Lamp in White is also available in Mustard, Ice Grey and Dusky Rose. Available in three glamorous colours – Ice Grey, Dusty Rose and Mustard – the single coloured table lamps will bring your tables, side tables, bedside tables and coffee tables come to life! Adding luxe texture as well as a ice grey colour pop to your ceilings, the velvet light shades will soften and add warmth to your home interiors making the All Over Velvet Table Lamp With Fringe –Mustard a particularly fabulous lighting choice for living rooms and bedrooms. Super glamorous, fun and a one-of a kind lighting choice, make a statement with this statement table lamp!